Myštice-Kožlí is a little village near the friendly town called Blatná in South-Bohemia. Here you can find a renovated former farm for sale which may be used for privet purposes (as a luxurious family house or county mansion with a big garden and plenty of possibilities to receive guests, in a nice and cosy village near the woods). It also can be used for commercial purposes (i.e. accommodation or campsite). Kožlí is situated in South Bohemia, a region known as the friendliest and most easy-going part of the Czech Republic. The attraction of the small village is its rural location, characterized by woods and many lakes, sloping landscapes with authentic little villages and interesting towns. The central location with regard to cities such as Prague, Pilsen, Èeský Krumlov and Písek, the natural beauty of the Vltava (Moldau) basin and the mountain region of the Šumava offers a lot of opportunities. There are very extensive routes for hikers and bikers. Those who love watersports can enjoy one or more of the many lakes, among which beautiful Lake Orlík, or the Vltava and Otava rivers. At a distance of approximately 60 car-minutes there are various skiing regions to be found in winter. Cross-country skiing or snow-hiking is possible in the immediate surroundings. 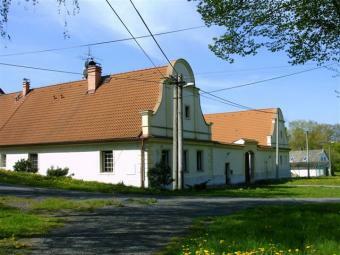 In Blatná, at 8 km. distance , you can find all necessary shops, supermarkets, the train- and bus station, banks, the post office, the polyclinic, schools, etc. The farmstead is a reconstructed farm originally built in style of Czech baroque. The farm consists of a residence (living room with fireplace, big kitchen, scullery, 4 bedrooms, luxurious bathroom with Jacuzzi , 2nd bathroom with toilet), apartment with 3 rooms, double garage, a little cottage, a big barn (which you can rebuild as a recreation area, a restaurant and/or apartments for guests), a court yard and several lawns. The total area of nearly 6200 m2 and is surrounded by a natural stone wall. There are several entrance gates made of wood. At the area you can find a swimming pool (9 x 3,5 m2) and sanitary facilities.